Originally introduced as a concept car in 1946, the first official Dodge Charger was introduced in 1966. The 1966 Charger was powered by a 318 cubic-inch V8 engine that delivered 230 horsepower. There was also an available 425-horsepower and 490 lb-ft of torque 426 cubic inch “Street” HEMI V8 engine. That particular engine helped to classify the Dodge Charger as a performance muscle car, which it is still classified as today. Over the next few decades, the Dodge Charger went through numerous designs and upgrades until it settled on its current 7th-generation design that launched in 2011. In 2015 Dodge released the Dodge Charger SRT 392, the same year the Charger SRT Hellcat was released as well. The SRT 392 engine was specially engineered by Fiat Chrysler’s advanced street and racing technology (SRT) team and it’s partially named after its 392 cubic-inch engine. The Charger SRT 392 is powered by a 6.4L V8 SRT HEMI MDS engine that generates 485-horsepower and 475 lb-ft of torque. The engine’s power is directed to the vehicle’s rear wheels via the state-of-the-art TorqueFlite 8-speed automatic transmission. What makes this HEMI engine so unique is its wider RPM range, a new exhaust system that improved fuel efficiency, and new paddle shift technology and adaptive damping suspension for improved driver control. The 2016 Dodge Charger SRT 392 goes from 0-60 mph in 4.2 seconds, and covers a quarter mile in 12.5 seconds. That’s 2.3 seconds faster than the Charger SXT’s standard 3.6-liter V6 engine, and 0.2 seconds faster than the Challenger SRT8. When compared with competing vehicles like the Ford Mustang V6, with a track time of 5.3 seconds, that’s over an entire second faster. Inside and out, the details and materials used on the Charger SRT 392 scream high-performance vehicle. Since the Charger SRT 392 generates a lot of speed, it needs to have a top-of-the-line braking system. So to give driver’s maximum control, Dodge equipped the vehicle with brakes specifically designed for performance vehicles, a six-piston Brembo brake system. The brakes feature 15.4-inch Brembo two-piece rotors and six-piston calipers that improve the brakes’ heat management, thermal capacity, longevity and ultimately – performance. For a smooth ride, there are high-performance Bilstein high-performance shock absorbers on Dodge vehicles sport-tuned suspension for improved balance and steering response. To further improve its aerodynamics and performance, the SRT 392 axles are made of lightweight aluminum to reduce weight, as are its 20-inch SRT hyper black forged aluminum wheels. The vehicle’s wheels are fitted with 275/40ZR20 all-season performance tires. 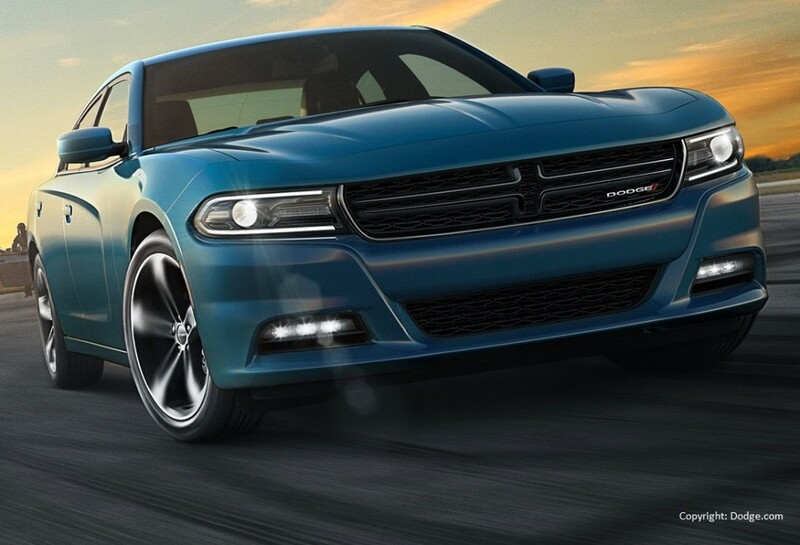 The exterior and mechanics aren’t the only beautiful thing about the Charger SRT 392. Inside are plenty of reasons why someone would want this muscle car. The 2016 Dodge Charger seats up to five people and the SRT 392 has leather trimmed seats that are heated and the front two seats are ventilated. use the system hands-free. Uconnect Access is also a standard feature on the SRT 392 model. Since this particular Charger is quite unique, Dodge offers a range of colors and ways for a buyer to customize their ride. The car’s exterior is available in eleven different color choices, including the exclusive 2016 Mopar color, Go Mango. Buyers also have option of four different interior colors including a black and red combination or all black. Nearly any safety feature one can think of comes standard or as an option on the SRT 392. All 2016 Dodge Chargers have a basic limited warranty of 3 years or 36,000 miles, a limited powertrain warranty for 5 years or 60,000 miles, roadside assistance and rust-through coverage for 5 years or 60,000 miles. The starting price for the SRT 392 prior to add-ons and premium choices is $50,995.